Many of you have probably heard that drying your laundry inside the house is not recommended because the evaporation from the laundry negatively affects our health. Craig Mather (43) from Bolton got a lung infection because he didn’t adhere to the warnings and dried his clothes inside his house. Mold spores which occur due to drying clothes in the room have caused him serious lung problems. Crag Mather, a father of three children, was diagnosed with chronic pulmonary aspergillosis and started to recover when he was prescribed drugs to fight against fungal infections. The doctor warned him that if he didn’t stop drying clothes indoors, his problems would become even worse. So when he stopped drying the clothes indoors for 12 months he noticed a great improvement in his health. He is not the only one with this experience. 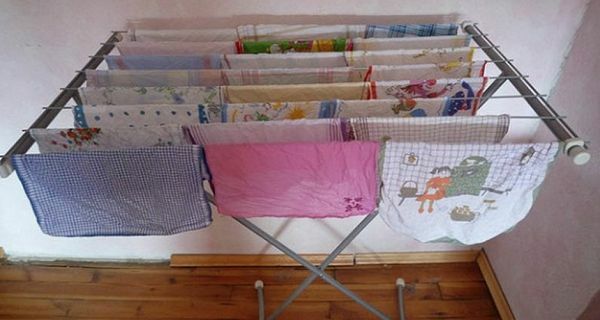 According to experts, drying the clothes indoors can lead to serious health issues. When you set the clothing on a radiator, the evaporation increases the humidity level up to 30%, thus creating ideal conditions for mold spores development. In one bunch of washed laundry there is more than two liters of water which is released throughout your room. Most people’s bodies can fight with the infection or are immune to those infections. But, people who have asthma may face with breathing problems and coughing. People who have weaker immune system, on the other hand, such as patients with AIDS, patients treated with chemotherapy or patients with autoimmune diseases may suffer from pulmonary aspergillosis caused by fungi. It is a disease that can cause really serious and often fatal lung damage. That’s why the experts’ advice is to dry our laundry in the dryer or outside and never in our living rooms and bedrooms.